The American Eskimo Dog (affectionately called ‘Eskie’ or by the German name ‘spitz’) actually descends from several German breeds such as the Pomeranian and Keeshond. It is not a close relative of the Alaskan Husky. The American Eskimo Dog was brought to America by German settlers in the early 20th century and became a popular circus performer. One Eskie named ‘Stout’s Pal Pierre’ became famous by walking the tightrope. Circuses popularized the breed by selling Eskie puppies after the show. The American Eskimo Dog was finally recognized by the American Kennel Club in 1994. 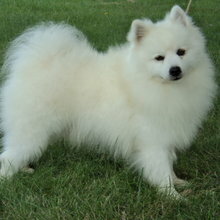 The standard American Eskimo Dog has a shoulder height of 38-48 cm (15-19 in) and weighs 9-16 kg (20-35 lbs). American Eskimo Dogs have a wedge shaped head and long, wolf-like muzzle. They have alert, triangular ears and black lips and nose. They are slightly longer than tall, with oval feet and bushy tails which hang over the back. The American Eskimo Dog has a two-layered coat. The undercoat is short and dense, and the outer coat consists of long straight hair. The coat is thicker and longer around the chest and neck, giving the appearance of a mane. American Eskimo Dogs must be white or biscuit cream--any other color is unacceptable. The American Eskimo Dog sheds twice a year. The American Eskimo Dog is intelligent, alert, inquisitive, and playful. It is fun-loving and outgoing, eager to meet and befriend everyone. It can sometimes be strong-willed. The American Eskimo Dog takes a while to mature and can maintain its puppy-like demeanor through the first year or two of life. All in all, Eskies make great pals. The American Eskimo Dog is intelligent, alert, inquisitive, and playful. It is fun-loving and outgoing, eager to meet and befriend everyone. It can sometimes be strong-willed. The American Eskimo Dog takes a while to mature and can maintain its puppy-like demeanor through the first year or two of life. All in all, Eskies make great pals. The American Eskimo Dog is very sociable with its family and good with children, other dogs, and household pets. It may bark at strangers, but it is not aggressive. You can find American Eskimo Dog puppies priced from $275 USD to $1600 USD with one of our credible breeders. Browse through our breeder's listings and find your perfect puppy at the perfect price. The American Eskimo Dog is very sociable with its family and good with children, other dogs, and household pets. It may bark at strangers, but it is not aggressive. The American Eskimo Dog should be brushed regularly to prevent matting, more frequently when shedding. The coat should not be shaved as shaving irritates the skin. American Eskimo Dogs groom themselves frequently and thus only need to be bathed 4-5 times a year. Eskies require frequent human companionship. They are comfortable in cool environments but cannot tolerate heat. They are prone to hip dysplasia and may be allergic to fleas. American Eskimo Dogs have a life span of 10 to 15 years (some live up to 20) and litters of 4-6. American Eskimo Dogs learn quickly and are eager to please. Harsh training techniques are not appropriate. American Eskimo Dogs should be trained early in life. Obedience training is recommended. The standard American Eskimo Dog needs a good workout every day and should be taken for a long jog or walk. Provide plenty of water and shade during exercise to avoid overheating from the heavy coat. Eskies enjoy dog sports. Without interaction they may become bored and destructive. American Eskimo Dog Puppies for Sale - Shipped Worldwide! Finding the right American Eskimo Dog puppy can be dog gone hard work. PuppyFind® provides a convenient and efficient means of selecting and purchasing the perfect American Eskimo Dog puppy (or American Eskimo Dog puppies) from the comfort of your home, 24 hours a day, 7 days a week. Take advantage of our PuppySearch or leisurely browse our directory of hundreds of dog breeds, American Eskimo Dog dog breeders, American Eskimo Dog dogs for adoption, and American Eskimo Dog puppy for sale listings with photos and detailed descriptions. Some American Eskimo Dog puppies for sale may be shipped Worldwide and include crate and veterinarian checkup. Many American Eskimo Dog dog breeders with puppies for sale also offer a health guarantee. With thousands of American Eskimo Dog puppies for sale and hundreds of American Eskimo Dog dog breeders, you're sure to find the perfect American Eskimo Dog puppy.